Q: Was Cars 2 made in Stereoscopic 3-D? Q: What Is the short that accompanies 'Cars 2'? Q: What model of cars are the various characters? The saddest thing about Pixar today is, they don't know what movie they are going to release on their 25th Anniversary since one of their upcoming projects "Newt" was cancelled despite from Blue Sky's Rio plot. 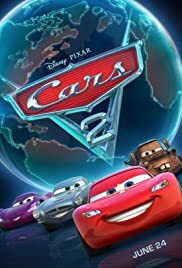 Cars 2 feels like it's a direct-to-DVD film. It's not really bad but it's just unnecessary. Though, the action is pretty cool. The kids will enjoy it but the rest is like Rango. Instead of Western Themes, it's Spy movies. The story isn't bad except it doesn't give anything emotional and heartwarming unlike the other Pixar movies. 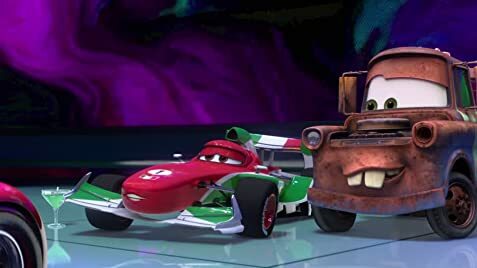 Cars 2 is pretty fun but the most important ingredient of their movies is missing. Firstly, the lead of the film is Mater. The theme of the film is Espionage but it's just some sort of an animated version of a particular spy movie. Everything moves here. There are too many action that any kid can enjoy but the story is probably too interesting for grown ups. If the movie gets focused to the plot, the kids might get bored. The missing Pixar element here is the heartwarming moments. The movie still has a heart but it fails to be compelling. Don't worry about the humor, that is one thing they will never fail. Some of the writing seems rushed. The voices do what they do best. John Lasseter knows what to do in this movie. The animation is obviously pretty good. The score is a bit generic that you may hear in any movie or television show. The action keeps everything moving. Watching the car fighting scenes is like watching a kid playing his little toy cars and let them do something fun. Which is pretty impressive. In Pixar, the craftsmanship or the animation doesn't quite matter. It's all about the compelling story and the emotional heartwarming moments. It's hard to say Cars 2 is bad film. Pixar still knows how to make a good movie but without their important elements, it's like you're watching a movie from a different studio. Once again, it's pretty fun but if you expect a lot of Pixar magic then you might get disappointed.